In the splendid isolation of Alaska, the air you breathe is rarefied air. The sights you see are rarely seen. The sounds you hear are rarely heard. And at any point in time you can be overcome by the feeling that you’re witnessing something remarkable and, yes, rare. From the fauna to the flora to the many spectacular formations, Canada and Alaska are unlike anywhere else. Where else will you encounter such a plethora of unique creatures, from the musk ox to the grizzly bear? Where else are nature’s acts of wonder so immediately accessible? Where else are there such endless vistas in such plentiful supply? 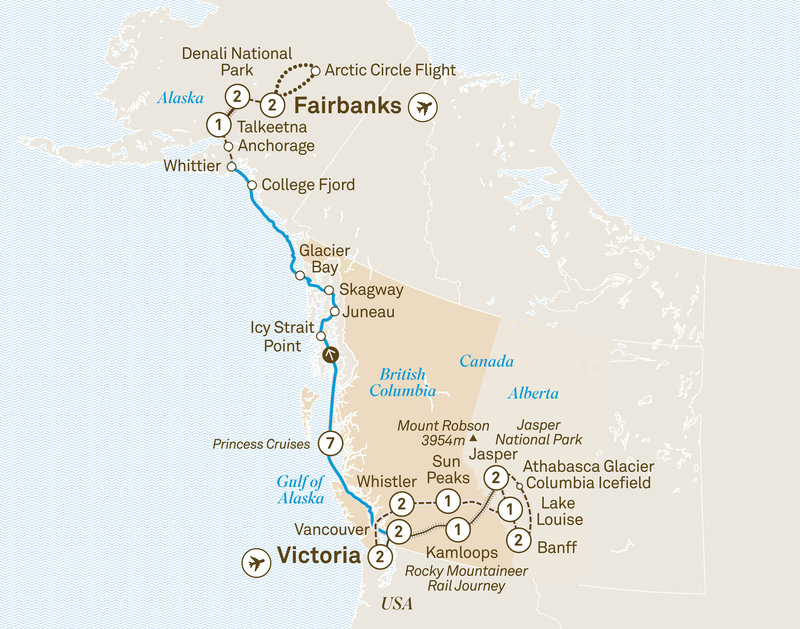 You’ll be transported to places that are completely off the map of most people’s lives, as well as landmarks of rare majesty, from the Rocky Mountains to Alaska’s College Fjord. Your wondrous journey begins with an exclusive two night Special Stay at the iconic Fairmont Empress. Celebrate tonight with a welcome dinner and toast to the wonderful adventure awaiting you and your fellow travellers. Visit beautiful Butchart Gardens and admire the floral displays and features. This afternoon can be as active or relaxed as you please. Tonight, choose between a selection of restaurants in Whistler. Floatplane flight - Soar over Georgia Strait on an optional one hour floatplane flight (additional expense). Choose your level of adventure from an array of exciting activities. Take a zipline adventure or the Peak 2 Peak Gondola. Alternatively, embark on a mountain adventure tour or a jet boat ride. During an exclusive, insightful presentation discover how life was lived by the voyageurs, pioneers, fur traders and early settlers as they battled to establish settlements along Canada’s trading route. Sleep in the quaint village of Sun Peaks at the Sun Peaks Grand Hotel. Reach Lake Louise and the opulent Fairmont Chateau Lake Louise, where you’ll enjoy a Special Stay in a stunning lakeview room. Tonight, choose between fine or more casual dining at your hotel. At sunrise, the snow-capped mountains are awash with pastel pinks, mauves and blues, so make sure you’re up early enough to see it. Later, small town charm and stunning mountain scenery greets you in Banff. Settle into your two night Special Stay in a valley or mountain view room at the Fairmont Banff Springs, the ‘Castle in the Rockies’. Meet a Canadian Mountie, wearer of the famous red serge. Delight in his colourful tales and take the opportunity to get a photograph. Choose between a selection of cuisines at your hotel. Explore the surrounding natural beauty of Banff your way. Travel along the Icefields Parkway, then take an ‘Ice Explorer’ onto the Athabasca Glacier. Arrive in Jasper for the next two nights and enjoy your rustic-style accommodation at the Fairmont Jasper Park Lodge, set on the banks of Lac Beauvert. Choose from a selection of restaurants at your hotel. A delicious dilemma. So many outdoor adventurers visit Jasper. You’ll appreciate why when you engage in one of the activities available to you today. Delight in one of the most iconic rail journeys in the world. Two days of GoldLeaf service is sure to be a highlight of your trip. Stay overnight at a Kamloops hotel, as assigned by Rocky Mountaineer. Arrive into cosmopolitan Vancouver for your two night stay at the centrally located and exclusive Fairmont Hotel Vancouver. Capilano Suspension Bridge Park opens early, exclusively for Scenic, so you can enjoy your tranquil stroll before the crowds arrive. Explore the many and varied sights, tastes and sounds of Vancouver during a city sightseeing tour. Later, enjoy dinner with your Tour Director and fellow travellers. Icy Strait Point is home to the Huna Tlingit tribes, which have remained in this area for more than 2,000 years.